Download the brief here. Strengthening the effectiveness of employment services for job seekers with disabilities is key for improving their employment outcomes and their financial self-sufficiency. The purpose of this brief is to examine the quality of employment services available to job seekers with disabilities, and to offer recommendations for improvement. Findings are from a longitudinal study that involved 61 employment 37 employment programs in 17 states. Data were collected through a survey employment specialists, delivered to the job developers, or participants’ business developers. smartphones every work day for one year. 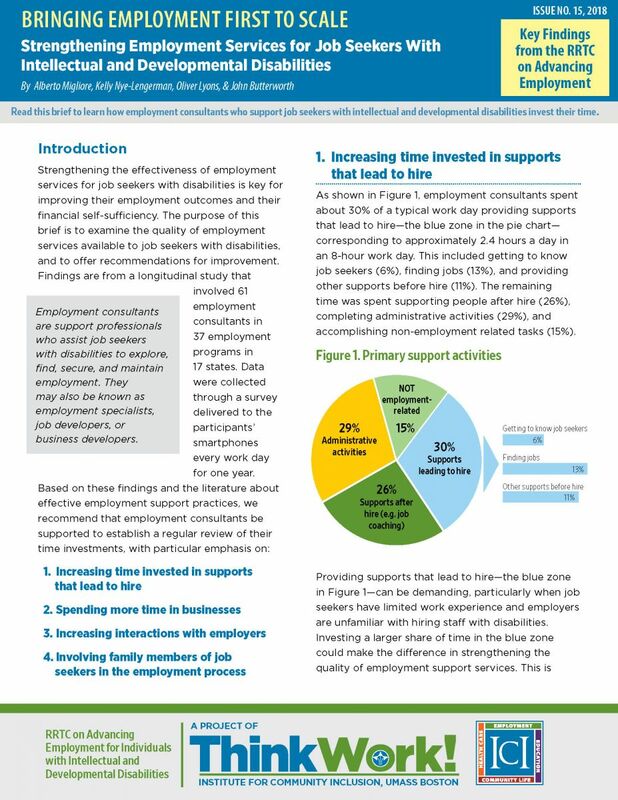 Based on these findings and the literature about effective employment support practices, we recommend that employment consultants be supported to establish a regular review of their time investments, with particular emphasis on: 1. Increasing time invested in supports that lead to hire 2. Spending more time in businesses 3. Increasing interactions with employers 4. Involving family members of job seekers in the employment process.